I showed them a photo of my dad’s (their Pop Pop) father. I asked them to guess his last name, which they did correctly and told them his first name, Robert. I told them he immigrated to the United States almost a hundred years ago from Russia on a boat, and not an airplane. I told them that he did not speak English and they wondered how he learned. I told them how he loved to sing and dance. I explained how when I was their age, he started to lose his sight until he became completely blind. They closed their eyes and imagined it. I said that he had an amazing memory and even after he could no longer see, he could recall detailed stories from his childhood, which he passed on to me. I remembered one involved him picking berries as a boy and coming face to face with an enormous bear. I told them that even after he could no longer see, he was the first on the dance floor, holding onto Pop Pop’s mom, slow-dancing. Then I asked them to tell me about someone special. My son pointed to me. I told him to choose someone else so he chose Daddy, then the dog, then cartoon characters. Finally, they both got so silly, that I dropped the subject. Either way, tonight provided a nice opportunity to share a part of myself and gave me a chance to reminisce. Ready for tomorrow’s challenge? 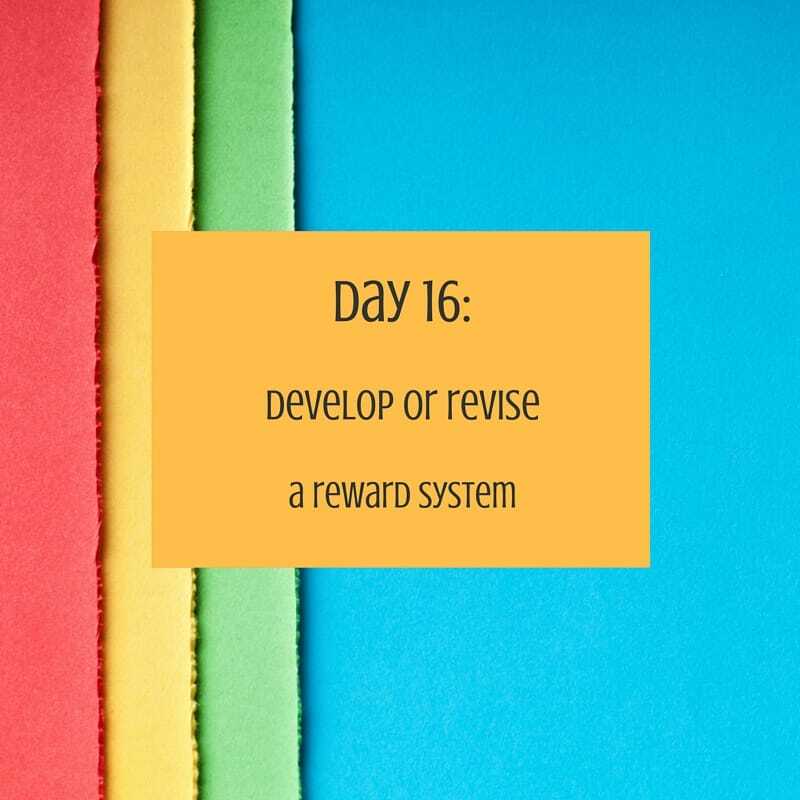 Day 16 is . . .
I’ve had a reward system for as long as I can remember. I’ve used the Melissa and Doug magnetic chart, written charts, marbles in a jar, apps upon apps. I’ve been using this free one for about a year rather inconsistently. In fact, I forgot about it. My son asked about it about a week ago and it’s made a big difference. If you already use a system, re-evaluate it. Do the rewards still motivate? Are the tasks still appropriate? If you don’t have one, I recommend trying it out for a while. Let’s touch base tomorrow.